Believing one’s own lies can often prove to be a fatal mistake. It would not be the first time that the Venezuelan right has fallen into that error. Ever since their attempt to form a parallel government, the rightwing has insisted that Chavismo is nothing more than Nicolás Maduro holed up in the Miraflores Palace, surrounded by an inner circle of corrupt military elite. It would only be a matter, they repeat, of leaning on something that no longer even really exists, like toppling a dead tree. They argued the same thing in 2017, overplaying their own strength and underplaying that of Chavismo. 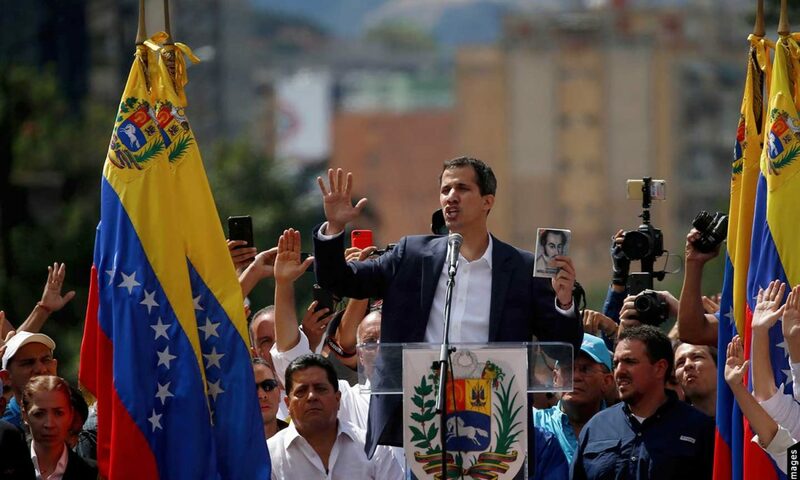 That analysis eventually led to a violent siege, followed by a succession of political defeats that set the stage for the current scene in which the Venezuelan rightwing has asserted their intent to overthrow Maduro, again, with the use of force. However, the reality of Chavismo is quite different. For starters, it has not been demobilized. This was evidenced by the march in defense of Maduro on January 23–completely ignored by the rightwing and mass media–and by the mobilizations that continued through into the following days, like the march on Friday in Vargas, a neighboring locality to Caracas. On this point it is important dismantle two rightwing myths. First, that popular support is based on a system of patronage, and second, that those who are mobilized in support of Maduro do so out of obligation. Between 37 and 41% of Venezuelans self-identify as Chavistas according to polls conducted by Hinterlaces. Their relation to the current political process varies: there are those who feel estranged or weary, owing in large part to deep economic difficulties; however, many more are ready to close ranks against the evident threat of a putsch directed by the United States. The militant side of Chavismo has another characteristic; an extremely high degree of organization and politicization. There is a significant organizational framework stretching across popular neighborhoods and rural zones. These include communal councils, communes, local supply and production committees, communal markets, peasant councils, productive enterprises and Bolivarian militias, among other phenomena. Chavismo has an important territorial and identitarian dimension. Because the rightwing has no organized presence in these territories, they employ for-hire armed groups to create focos in hopes of gaining popular support. Beyond the popular base, there is the United Socialist Party of Venezuela, the principal political instrument of Chavismo and the largest party in the country, which is showing no signs of splitting. The unity displayed by the Party in the face of recent aggression has been overwhelming. The rightwing is nevertheless seeking to fracture the Party, encouraging desertion among the disaffected who can then be held up as heroes. This show of political strength is underscored by the Bolivarian National Armed Forces (Fanb) and government agencies’ unwillingness to respond to the call for a putsch. Whereas in 2017 the Venezuelan right managed to turn the Prosecutor General against the government, this time a single magistrate of the Supreme Tribunal of Justice abandoned his post and requested asylum in the United States. That is to say, very little governmental shakeup considering the hostile actions being put on the table. Chavismo’s much touted frailty is a rightwing fabrication belied both by the nation’s popular layers and its upper echelons. Can the Venezuelan right still really believe their own assertions? All this is not to say that there are no fragilities, many of them the product of repeated attacks, others brought about by government mishandling or internal instabilities. The economic scenario is the single most corrosive factor. Which is why the United States’ announced strategy is to deepen and broaden the economic blockade, to desiccate an oil-dependent economy that relies on imports. Likewise, it has become clear that the parallel government’s future plans depend on international interests and not the domestic arena. The lack of coordination between the two variables is all too plain to see for those living in Venezuela. Saturday was one clear example: as the weekend began in routine fashion in Caracas and throughout the country, an extraordinary session of the UN Security Council became the battleground between the US-led bloc and the countries opposed to foreign intervention. It is there that the main action is taking place. The Venezuelan right seems to be waiting to receive further instructions from abroad, depending on the future outcome of determinate events. International support has quickly divided into two blocs: Russia supporting Maduro, while the opposition enjoys the backing of the self-proclaimed “international community” of the United States, France, Germany –de facto ruler of the EU– and Spain–interested in setting the agenda in Latin America for neocolonial reasons–, along with Great Britain, Canada, and the Lima Group. It is still too soon to hazard any kind of prediction about the future evolution of these variables, although all developments up to this point suggest that the United States is advancing step-by-step along an established plan. The question has now become: what timeline are they working with for the overthrow of Maduro? With what agents? Perhaps they are now thinking in the medium-term? One element in particular has yet to come into play: the Colombian government. To underestimate one’s adversary–in this case, enemy, given the way the conflict has unfolded–is a basic error. The right cannot seem to do anything but repeat this mistake. Will the United States do the same? From Página/12 (Argentina), translated by Nicolas Allen.